The Church of the Holy Spirit in the center of the Old Town seen from the Philosophers' Walk. 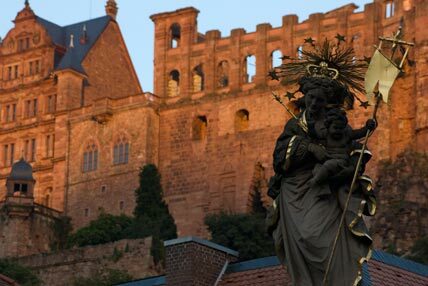 The Philosophers' Walk runs along the hillside of the Michelsberg above the fine villas of Neuenheim and offers a stunning view of the castle and Old Town. 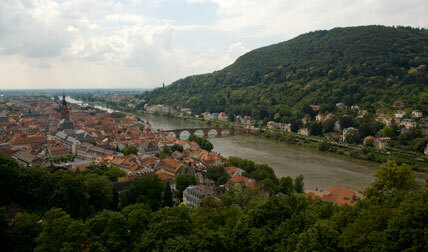 This photo, taken from the terrace of the castle grounds, shows the Michelsberg, the Old Bridge across the Neckar, and the Old Town. 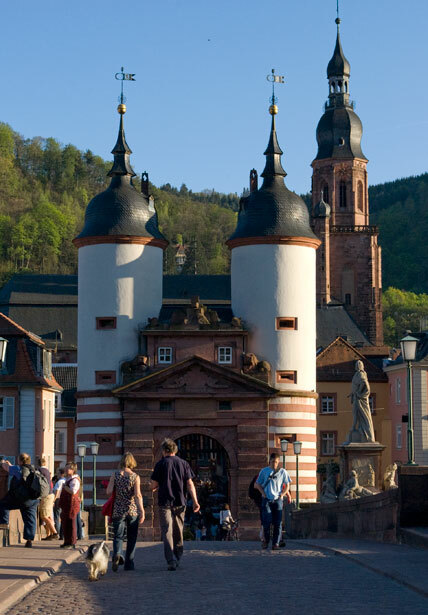 Visitors who enter the Old Town by way of the Old Bridge are welcomed by the Haspeltor tower gateway at its end. 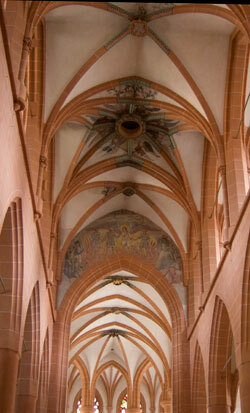 Directly behind that, the Sterngasse, with its romantic restaurants, leads you to the Church of the Holy Spirit. 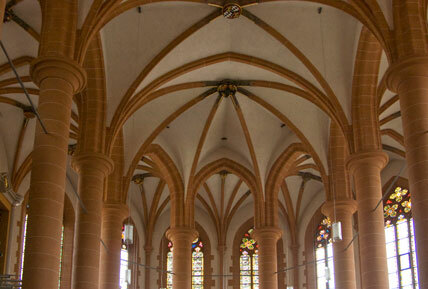 The Gothic choir of the Church of the Holy Spirit. The Church of the Holy Spirit became Protestant after the reformation under Prince-Elector Ottheinrich (1556–1559). From 1706 to 1936 a religious declaration stipulated that the Church of the Holy Spirit was to be divided down the middle by a partition and used by both confessions. The partition was finally taken down in 1936 when the church once more became the possession of the Protestant church of Baden. 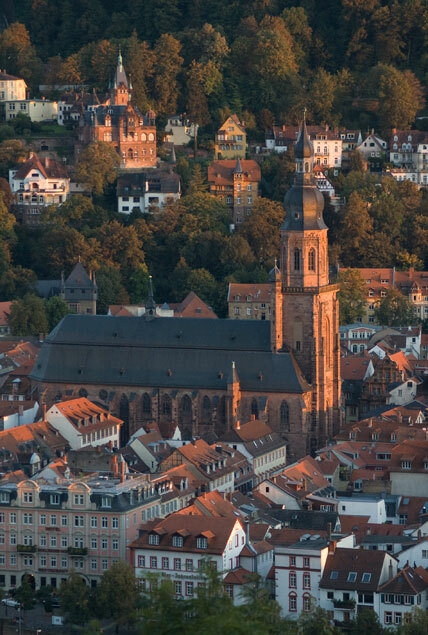 There is a fantastic view of the Old Town and the castle from the church tower. 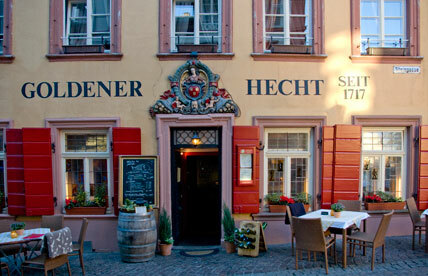 From here it's only a few steps to one of the best-known buildings of the Old Town, Hotel Ritter. 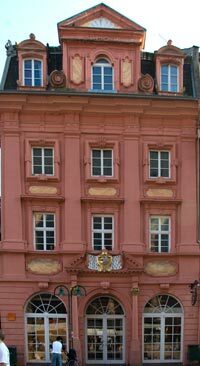 The "Zum Ritter" Hotel was one of the few buildings to survive the War of the Palatinate Succession unscathed. 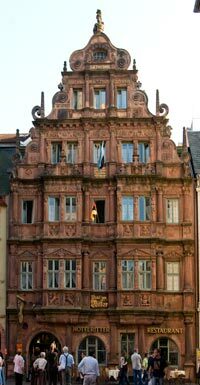 It is considered one of the most beautiful houses in the Old Town of Heidelberg. 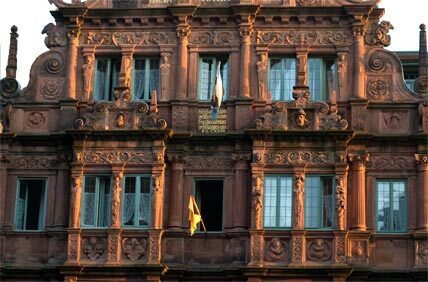 Built in the late Renaissance period (1592), it served as an inn and hotel as early as 1681. 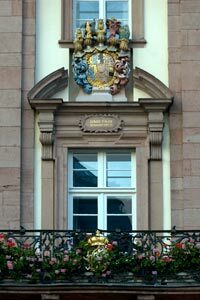 The house is situated on the Marktplatz (Market Square), opposite Heidelberg's oldest church, the Church of the Holy Spirit. Even the insides of the hotel are still for the most part in their original state. 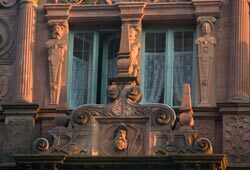 These details, bathed in evening sunshine, reveal the true beauty of the facade. 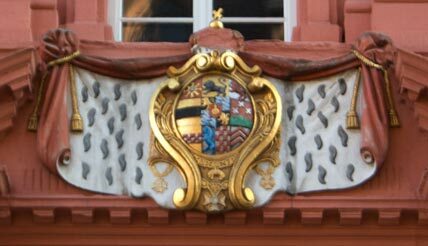 This proud Baroque house, with its splendid coat-of-arms, is situated only a few houses further on. From here at the Marktplatz (Market Square) you get a good view of the castle but there is an even better view of the castle from the Kornmarkt (Corn Market), a few steps further on. 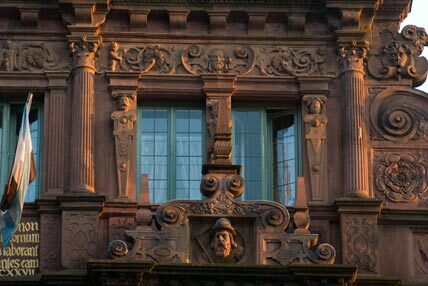 Heidelberg's special flair is especially obvious in the pedestrian zone. Here, even after the shops have shut, it is still bustling with life. A beautiful Sunday in late summer in the Hauptstrasse (Main Street). 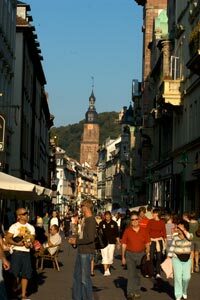 Incidentally, Heidelberg's pedestrian precinct is the longest in Germany. Cafes, restaurants and bars line the pedestrian precinct. Here you can enjoy your coffee sitting under banana shrubs and the fanned leaves of palms. 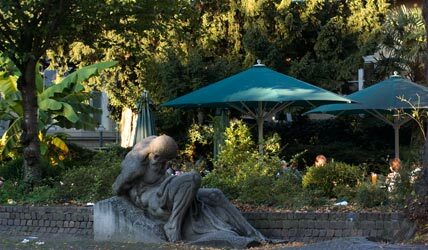 But it's also worthwhile taking a look at the areas away from the Hauptstrasse. The most popular student bars can be found in the sides streets of the Old Town. 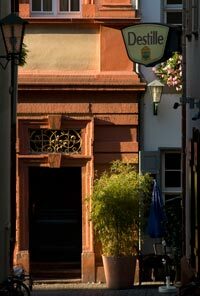 The Plöck, a traffic-calmed road running through the Old Town parallel to the Hauptstrasse, is known for its very individual shops and its reasonably priced food. 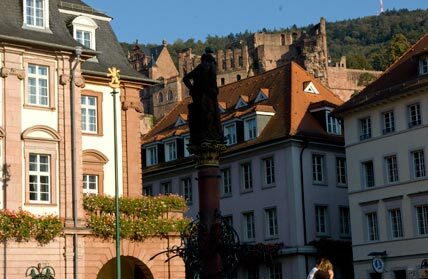 The castle seen here from the Kornmarkt (Corn Market) with the statue of Maria in the foreground. The Town Hall on the Marktplatz (Market Square). 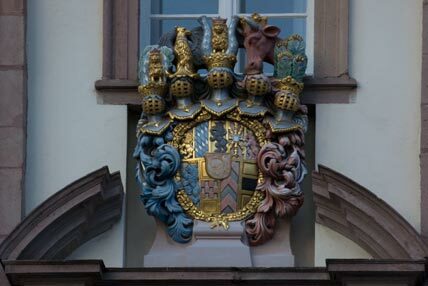 The Coat-of-Arms of the town of Heidelberg, the residential town of the Prince-Electors, crowns the arch above the balcony over the main entrance. 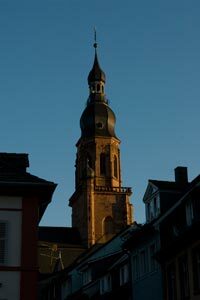 It's possible to climb up the tower of the Church of the Holy Spirit. 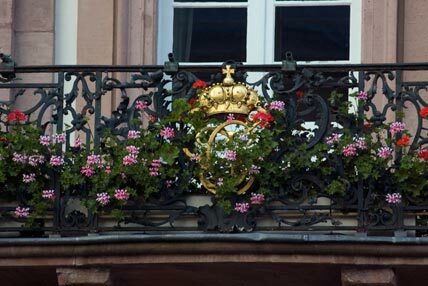 From the surrounding balcony you have a splendid view of the Old Town and the castle.